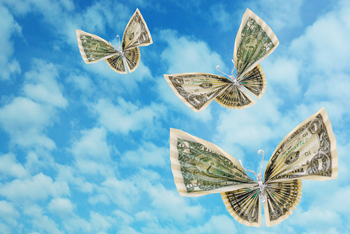 ›Child Nutrition, Nutrition›$500 Million Dollars To Chase an Elusive Butterfly? On February 4th, Michelle Obama announced a $500 million dollar donation from the Robert Wood Johnson Foundation toward the “the fight against childhood obesity.’ Yes, $500 million toward the phrase I want to eliminate! (Let’s Not Talk about Obesity in 2015) Here we go again. First of all, I think it’s great anytime any money goes toward the best interests of children. I only prefer it went toward child wellness not “ensuring children grow up with a healthy weight.” Let me explain. “Healthy weight” may or may not be achievable. Weight is an elusive butterfly. Why not put money toward creating community environments that support healthy living instead? Ensuring playgrounds for children is much easier than getting children to nail a number on the scale. Ensure that all children enter kindergarten at a healthy weight. This is a horrible way for children to start kindergarten – with a weight target on their backs. It means the focus is going to be on weight not wellness, and it reeks of discrimination, too. It also means someone will be monitoring weight, which may make children and parents anxious. This already happened in Massachusetts in 2013. Why repeat bad history? Make a healthy school environment the norm and not the exception across the United States. I agree, yet did Ms. Obama forget that she “partnered” with the National Beverage Association, National Restaurant Association, Grocery Store Association, Coca-Cola, Mars, and Kellogg’s, etc. in her Let’s Move Campaign? It’s pretty tough to have a healthy school environment with neon pop machines calling out to children in the hallways and the aromas of McDonald’s and Pizza Hut greeting them for lunch. I know from experience having engaged in this battle 12 years ago in my own community. Until Ms. Obama “unpartners” with her friends in the industry, her words are mere lip service. Make physical activity a part of the everyday experience for children and youth. I agree –children need recess, and PE, but they also need other options than being strapped to a desk all day long. My twin sister taught school for 30 years and she had simple classroom practices that encouraged movement. It’s not rocket science. They also need safe neighborhoods and safe routes to school that encourage those nearby to walk. Eliminate the consumption of sugar-sweetened beverages among 0-5 year olds. I can think of so many other ways and ideas to capture this without phrasing it in an absolute, so I will offer only one here. Instead of handing out free formula, find more support and financial incentives for women who breastfeed. Breastfed babies are less likely to be overfed, and breast milk does not contain added sugar. I don’t know who created the goals for this gigantic RWJ grant. With 20+ years of experience in the public health trenches fighting for local nutrition policy while working with families, a bit of common sense, and a true heart for children, you can bet I would have liked to have been on that committee.